Cockroaches as pests are very problematic to get rid of, not only are they creepy to look at, but can actually make people sick. Therefore, if you have seen even one cockroach in your home, extermination is essential. 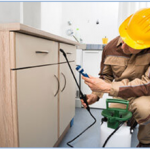 Fortunately, you have options, which includes hiring a Toronto company that offers proficient pest control services to ensure immediate removal rather than using home remedies for roaches. If the problem is minor, choosing natural ways to get rid of cockroaches works well. However, if you are facing a full-blown infestation, you need to seriously consider professional pest control in Canada. Remember, these critters hide from light, so you will probably only see them at night or in darkened rooms. The problem is that even if you see just one cockroach, there is a good chance that it belongs to a colony of hundreds, perhaps more. For minor infestations, below are few home remedies for Roaches that you can apply. Bay Leaves – Common bay leaves like you use for cooking work great for ridding your home of cockroaches. Simply leave a handful in corners, under kitchen appliances, and near sink drains where these pests often congregate. Mothballs – Although mothballs may not have the most pleasant smell, they work great for warding off cockroaches. Place one or two balls in areas where these pests are likely to go. However, keep them out of the reach of children and pets. Ammonia – Cockroaches often hang out near pipe drains, so fill a bucket with water, add 1 cup of full-strength ammonia, and then pour it down toilets and drains. Mouthwash – Mouthwash, specifically Listerine, also helps eliminate roaches. Simply fill a spray bottle with 3 parts mouthwash and 1 part water, spraying the mixture around kitchen and bathroom areas. Mint Oil – Sprinkle mint oil on cotton balls or mix 3 parts oil with 1 part water in a spray bottle. Then, place the cotton balls or spray the mixture in corners, around sinks, and under kitchen appliances. Vaseline Trap – Another one of the most effective and natural ways to get rid of cockroaches involves making a trap using Vaseline or any brand of petroleum jelly. Take a jar lid, place a small amount of sweet fruit inside, and then line the rim with the Vaseline. The cockroaches will work hard to get to the food, but after eating, they get trapped in the gooey substance. If you have tried several home remedies without success, it is time to call in the Calvary. Pestico is a leading expert in all types of pest removal, including cockroaches. You can visit our website to learn about our services or call us for an appointment.